Welcome back to Toddler Fun Friday – a great opportunity to share your best toddler recipes, crafts and activities. We had lots of great activities linked up last week! You can find all of the past activities on our Toddler Fun Friday Pinterest Board. All posts submitted are shared on this board so make sure you are following. Our Toddler Boredom Buster posts also feature many of the activities that are linked up so make sure you check them out too. Make sure you visit Mom Explores Virginia Beach and Kidz Activities to see their featured posts too! Kidz Activities – Facebook, Twitter and Pinterest. 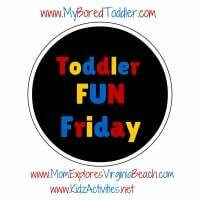 If you tweet your link to @myboredtoddler @momexploresvb and @kidz_activities with the hashtag #ToddlerFunFriday we will retweet. Thank you so much for the feature and for hosting such a fun party!